DSM has debuted its new carbon fiber filled polyamide (PA) 6/66 filament grade, Novamid ID1030 CF10 for 3D printing. 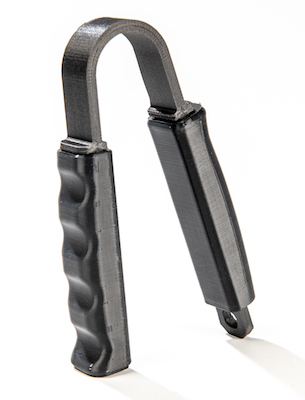 Despite the low carbon fiber loading of 10% much lower than other carbon filled materials—it can be used to fabricate functional prototyping and industrial parts with properties close to what is usually achievable only by injection molding while matching the easy and fast printing of unreinforced plastics. Novamid ID1030 CF10 3D is designed for printing structural parts which are clearly stronger, stiffer and tougher with higher tensile strength and modulus, high dimensional stability and free of warpage. Novamid ID1030 CF10 is available in 1.75- and 2.85-mm sizes, on environmentally friendly cardboard spools for easier recycling, at DSM AM distributors, including from DSM AM distributors FormFutura, MCPP, and Nexeo3DSolutions DSM recently revealed Dutch firm FormFutura as its latest distributor of AM filaments.